WASHINGTON, DC, January 8, 2013 (ENS) – Federal ocean safety regulators have launched an expedited, high-level assessment of the 2012 offshore Arctic drilling program in the Beaufort and Chukchi seas, Secretary of the Interior Ken Salazar said today. To be completed within 60 days, the assessment will focus on challenges that Royal Dutch Shell encountered in connection with certification of its containment vessel, the Arctic Challenger; the deployment of its containment dome; and operational issues associated with its two drilling rigs, the Noble Discoverer and the Kulluk. Shell’s conical drill rig Kulluk, which has no propulsion of its own, was towed to a safe harbor location in Kiliuda Bay, Alaska, where it arrived at 10 am Monday after a journey of 45 nautical miles. The Kulluk was grounded for a week off Sitkalidak Island in the Gulf of Alaska after it repeatedly broke tow during near-hurricane conditions on New Year’s Eve during a tow from the Beaufort Sea to Seattle for maintenance. The Coast Guard Cutter Alex Haley escorted the Kulluk in tow to Kiliuda Bay along with other support vessels. Monitoring by the oil spill response vessels escorting the tow confirmed that there was no discharge of oil during the transit. A 500-yard safety zone around the Kulluk is in place in Kiliuda Bay, and the combined fleet has 15,000 feet of boom should it be needed. The U.S. Coast Guard has begun a comprehensive marine casualty investigation of the Kulluk, its current condition and the circumstances that led to its grounding. The Interior Department’s Bureau of Safety and Environmental Enforcement, BSEE, and the National Transportation Safety Board will provide technical assistance for the Coast Guard investigation. Shell used the 514-foot Noble Discoverer for drilling at one well at the Burger-A Prospect 70 miles offshore in the Chukchi Sea. But the Liberian-flagged vessel has been plagued with problems and these are being investigated by Coast Guard inspectors who have not ruled out criminal charges. The review of Shell’s Arctic activities will be led by Interior’s Bureau of Ocean Energy Management Director Tommy Beaudreau, who has been selected to serve as the Acting Assistant Secretary for Land and Minerals Management. The review will look into Shell’s safety management systems, its oversight of contracted services, and its ability to meet the standards in place for Arctic development. During limited preparatory drilling operations last season, Shell constructed top-hole sections for one well each in the Chukchi Sea and the Beaufort Sea. BSEE personnel conducted unprecedented oversight and had inspectors present onboard each Shell rig around the clock throughout those operations. 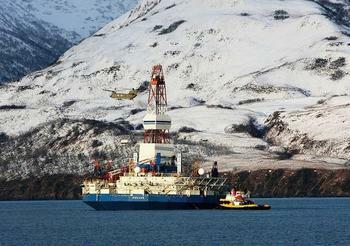 Environmental groups, including the Natural Resources Defense Council, The Wilderness Society and Greenpeace have called for a halt to drilling permits in the Arctic, saying the pristine and environmentally fragile region cannot withstand a spill. Secretary Salazar said the high-level assessment will help inform future permitting processes in the Arctic. “Developing America’s domestic energy sources is essential for reducing our dependence on foreign oil and creating jobs here at home and the Administration is fully committed to exploring for potential energy resources in frontier areas such as the Arctic,” said Salazar today. “Exploration allows us to better comprehend the true scope of our resources in the Arctic and to more fully understand the nature of the risks and benefits of development in this region, but we also recognize that the unique challenges posed by the Arctic environment demand an even higher level of scrutiny,” he said. “Thanks to the professionalism, dedication, and skill of all those involved in the recovery effort, I’m pleased to say those objectives have been met with no significant injuries and no environmental impact,” Odum said.